Why are we coming here today, and what do we comme­mo­rate with this Gedenk­tafel (Memo­rial Plaque)? For me the answer is easy. This buil­ding was the place where my grand­fa­ther, Karl Kutschera built what he called ‚his life’s work‘ from 1919 until he died in 1950. My Stief­gross­mutter, Jose­phine Kutschera Hilde­brandt carried it on until the early 1970’s. My father managed the busi­ness before emigra­ting to America in 1938. I first came here in 1950 when I was three years old. But what exactly was Karl Kutschera’s life’s work? He grew up in a small farm village of Upper Hungary, now Slovakia. His parents owned an inn and farm­land. As a young boy, Karl fell in love with the atmo­s­phere in the inn, where town­speople and guests gathered. He saw a kind of magic happened when people came toge­ther over coffee, food and drink. They became happy. They became joyful. Some­times they even became crea­tive. So at 13 he moved to Vienna, the capital of coffee house culture to learn the busi­ness. He worked in cafés where writers, compo­sers, artists and intel­lec­tuals sat with their coffee and wrote books, theater plays, news­paper columns or essays; they composed music, sket­ched pictures or ideas for buil­dings. They dreamed up new inven­tions or scien­tific concepts. And when they gathered around their Stamm­ti­sches (Regular Tables), they not only made jokes and gemüt­lich (genial) cama­ra­derie, they discussed, debated and colla­bo­rated. My grand­fa­ther under­s­tood that this vital European insti­tu­tion could be a public place to inspire and advance civi­li­za­tion. 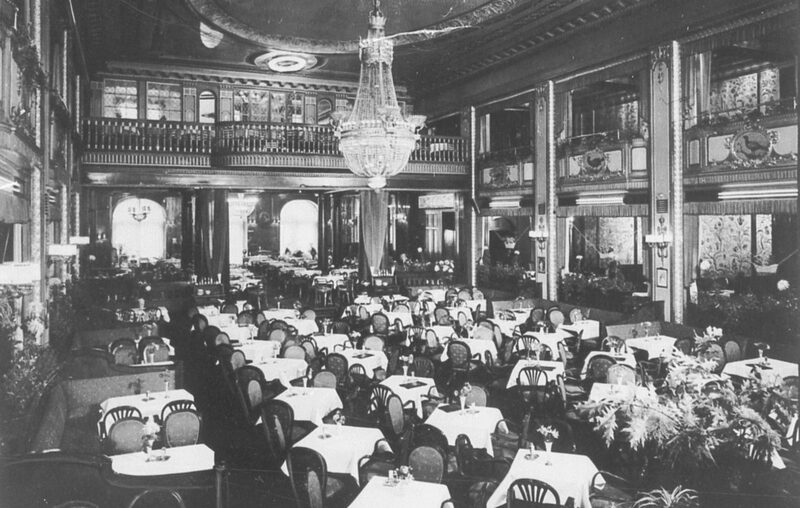 When he came to Berlin in 1900, Karl Kutschera wanted that kind of café, along with other famous Berlin cafés, the Roma­nisch, the Café Des Westens, – a place in the middle of the city where people with great minds and talents could come and escape the noise and clutter and clatter of the big city and be able to open up their minds and spirits and souls to contem­plate new art and lite­ra­ture, new music and fashion, new inven­tions, new ideas. And then, a few years after the dest­ruc­tion, humi­lia­tion and chaos of the First World War, suddenly mili­ta­ri­stic, stodgy Berlin flowers in the Golden Twen­ties into a Welt­stadt and anybody who wants to be on the cutting edge has to come to Berlin. And, yes, they came. In the chairs and around the tables in Café Wien, sat famous play­w­rights, jour­na­lists, cabaret, theater and film produ­cers and direc­tors and actors and actresses. Often they met at a large round table, their Stamm­tisch in the back and one of the things they did was pay for fifty up and coming artists and writers a day of their choice to come and dine at Café Wien. It wasn’t until after Karl Kutschera died that one of the group confessed that the idea was Mr. Kutschera’s who paid for it, but swore them all to secrecy. Kutschera wanted it known as their gift. Up in the billiard room, a young film writer, Billy Wilder came with his director friend Robert Siodmak thin­king up scenes for his first credited film, Menschem Am Sonntag (People On Sunday) – which premiered in the adjoi­ning movie theater in 1929. Dancer Jose­phine Baker showed up one evening in a group that included theater producer Max Rhein­hardt. Boxing cham­pion Max Schme­ling enter­tained his Jewish friends often down­s­tairs in the Zigeuner­keller– before helping them escape to freedom. Albert Einstein sat in Café Wien conver­sing with world chess master and philo­so­pher, Emanuel Lasker. 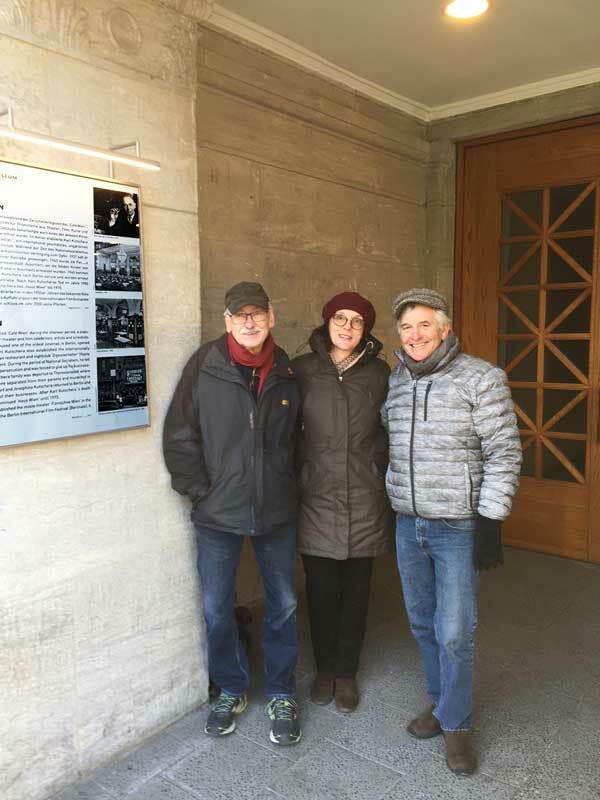 Another Einstein friend and colla­bo­rator, Leo Szilard who had desi­gned the first elec­tron micro­scope tried to persuade inventor, Dennis Gabor, the father of holo­graphy in Café Wien to build it in 1928. Unfor­tu­n­a­tely, German civi­li­za­tion was not solid enough to with­stand the forces that led to National Socia­lism, and Karl Kutschera and most of his family who had not left Germany, lost ever­ything and were sent to Concen­tra­tion Camps. His two youn­gest children, his brothers and sisters, aunts and uncles, cousins, his colleagues perished. But Karl and his wife, Jose­phine survived and returned to Berlin, and Café Wien was returned to him. What was he to do? Leave Berlin, sell the café and settle with survi­ving family in other coun­tries? No, he chose to stay in Berlin. He chose to believe that as horrible as Germany had become, there still burned in some of the people a light of civi­li­za­tion he had always worked to build in Berlin. His older son, my father who had left for America did not agree with him. But Karl persi­sted and through the tough years after the war main­tained Café Wien as a symbol of what Berlin had been and still could be again. When he died in 1950, my Stief­gross­mutter (Step-grand­mo­ther), Jose­phine kept it going and then married Paul Hilde­brandt; and toge­ther they helped create and host in their Film Bühne Wien and Café Wien the Berlin Film Festival which brought the city inter­na­tional cultural stature once again. This is why this buil­ding is so important, not because of the cele­bri­ties, but because Karl Kutschera dedi­cated himself to making Café Wien a place where people over a cup of coffee and a strudel, could ulti­mately contem­plate how to make society better or at least, more enjoy­able.